Yahoo has posted an exclusive (i.e. official) first look at several exclusive item coming this Thursday, May 25 to Disney Stores. 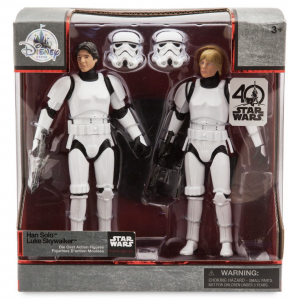 Head on over to check out the Elite Series Han and Luke in Stormtrooper Disguise Two Pack, ornaments, figurine/statue, pins set, Tsum Tsums and more. 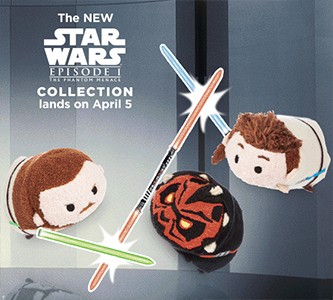 Disney Store has posted a preview of their next assortment of Star Wars-themed Tsum Tsum plush characters. Available on April 4, the Revenge of the Sith set includes General Grevious, Clone Trooper*, Obi-Wan Kenobi and Darth Vader/Anakin Skywalker**. **I also assume that the image take for the graphic above has been horizontally flipped and Anakin’s scar is over the wrong eye. 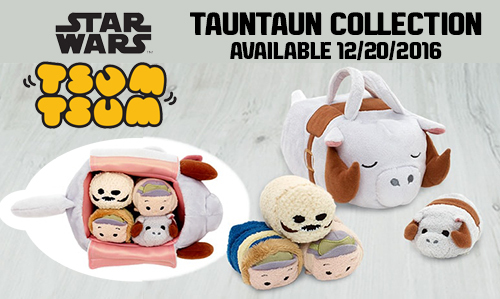 Also launching Dec 20, Disney Store is this ingenious Tauntaun Collection featuring 4 mini Tsum Tsum figures (Luke Skywalker, Han Solo, Walmpa and Tauntaun) back inside the plushy innards of a Tauntaun carry bag. 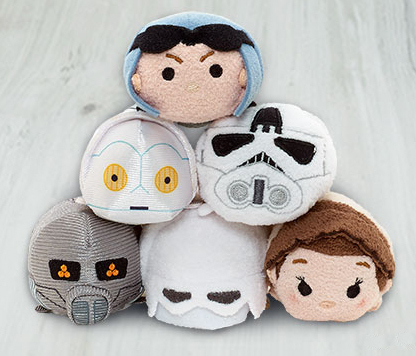 Launching Dec 20, Disney Store will be offering a new set of Hoth inspired Tsum Tsum that include General Veers, K-3PO, AT-AT Driver, 2-1B, Snowtrooper, and Princess Leia. Starting today, DisneyStore.com and brick & mortar locations are now offering their Attack of the Clones Tsum Tsum Collection. This assortment includes Mace Windu, Plo Koon, Aayla Secura, Padmé Amidala, Count Dooku, Anakin Skywalker and Jango Fett. 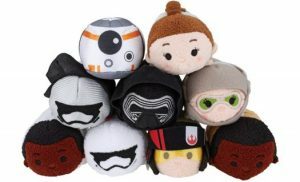 Disney Store now has the newest Tsum Tsum collection featuring characters from The Force Awakens available in store and online. Head over to check out the entire selection of plush in various sizes as well as clothing for men and women. Despite the majority of retail outlets being devoid of new products on shelves, there are still a few surprises as online retailers are receiving a “new” 6″ version of Rey – which may be just different enough to make you mad/sad. Funko continue to promote like no other brand as teases for the next Smuggler’s Bounty box have sparked some discussion of potential for new characters. The biggest (and most spendy) news of last week was the announcement of an ultra-high end tier of prop replicas from Propshop – the manufacturer responsible for the very same screen used props in The Force Awakens. And finally, we close out Episode #99 with a few new acquisitions to tide us over until the next “must-have” item comes along. 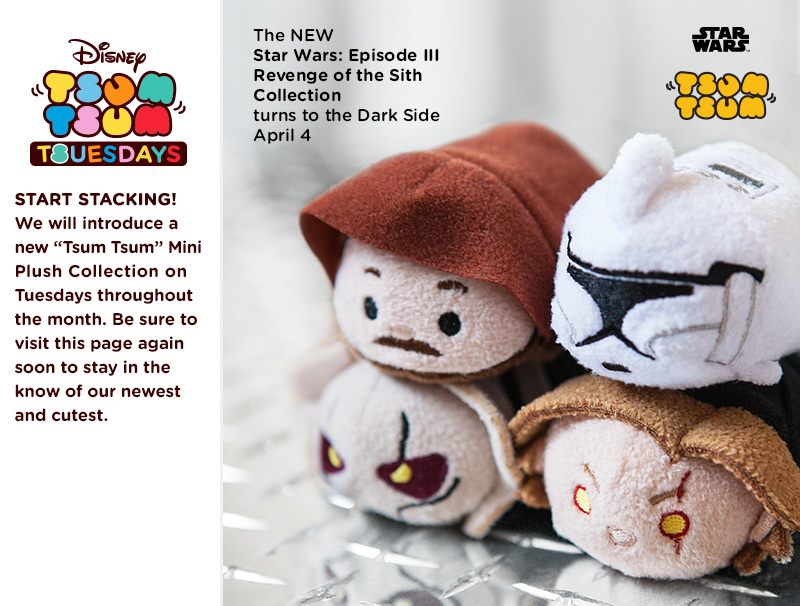 Our friends at Vinylmation World have posted official images of the upcoming assortment of Tsum Tsums for The Force Awakens. The mini collection will contain BB-8, Rey, Captain Phasma, Kylo Ren, Rey (Scavenger Outfit), Finn in Stormtrooper Outfit, First Order Stormtrooper, Poe Dameron and Finn. Head on over to check out the full details including medium and large size characters. Thanks to Jenmarie / @acrossthestars for the alert. 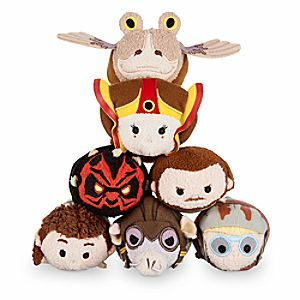 DisneyStore.com also has the new collection of The Phantom Menace Tsum Tsums available. Choose from Obi-Wan, Qui-Gon, Anakin, Darth Maul, Sebulba, Jar Jar Binks and Queen Amidala.